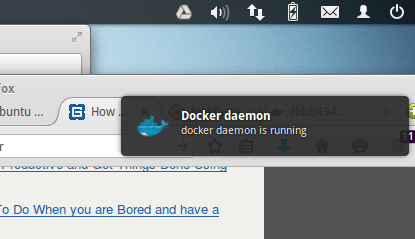 While installing docker, I decided I needed to write some notifications to ensure the configuration works. See Docker. I started with a TCL/TK script, which these days looks a bit old school, and writing the packer was (& remains) difficult. Virtualbox reports its status on Ubuntu via a very pretty interface, prettier than Apple script anyway, so I thought I’d have a lock. The command is notify-send. This is part of the desktop, obviously not needed if running headless. It comes with some standard icons, somewhere in the /usr/share/icons directories, allegedly, I made myself a docker icon, .png 32×32 to decorate the message.